Rather than grab a Pumpkin Pie from the bakery give one of these Thanksgiving desserts a try this year. From no-bake desserts to made-from-scratch recipes, you will surely find a dessert recipe perfect for serving at your Thanksgiving. These Cranberry Bliss Baklava Bites from Peas & Crayons cover all bases. They are crispy and crunchy, salty and sweet. And best of all, they are no-bake! Nothing screams Thanksgiving Dessert quite like pumpkin pie. But why not try these decadent Pumpkin Cheesecake brownies instead?! Nutter Butter cookies, Swedish Fish, Fruit Roll-Ups, mini M&Ms and candy eyes turn these cupcakes from plan to turk-a-rific! These are easy to make and super cute, a treat the little ones will absolutely love. If you are looking for the perfect individual-sized dessert for your Thanksgiving these Mini Pumpkin Chocolate Chip Bundt Cakes are just the thing. The Frugal Mom brings us a super-easy recipe that requires no baking at all, just some simple assembly. Candy eyes, orange M&Ms, and icing turn these plain-old Nutter Butter cookies into to adorable turkeys in a matter of seconds. What is better than a pumpkin pie flavored cookie that is the perfect size for dipping into your coffee?! Nothing, that's what. Packed with oats and apples, these bars sneak some healthy food into dessert. Top with vanilla ice cream and a drizzle of caramel for a super heavenly treat! These “sweet” turkey suckers are perfect for serving at your Thanksgiving party or even for having out as favors. Made with Jolly Ranchers, Red Hots, and Tic-Tacs, these lollipops are sure to be a hit with the kids and get gobbled up in no time! If you are searching for a Thanksgiving dessert that can be thrown together in a snap, this Rustic Cranberry Apply Pie is perfect. Using refrigerated pie crust, cranberry sauce, and apple pie filling, this beautiful pie comes together in no time at all. While pie is a very traditional Thanksgiving dessert, this easy-to-make Sweet Potato Pie is something fun and different to try. These tasty pumpkin spice cupcakes are frosted to look like actual pumpkins. How neat is that? These adorable turkey lollipops are perfect for any candy-corn lover! They feature not one, not two, but three flavors of candy corn! This pumpkin cobbler makes the perfect dessert for your Thanksgiving party. Serve with a scoop of French Vanilla ice cream for a treat your guests are sure to love. A little imagination, and some candy, turns these sugar cookies into cute little turkeys in no time. If you are looking for a beautiful and elegant Thanksgiving dessert that can also double as a centerpiece, this Thanksgiving Cupcake Bouquet is just the thing. It is absolutely stunning when it is complete! Happy baking and have a great Turkey Day! Gobble Gobble! Which of these Thanksgiving dessert recipes will you this year?! I would love to know in the comments below. « Blue Apron Review + How to Get a FREE Blue Apron Box! I’ve been looking for new ideas. These are so pretty! So many great Thanksgiving recipes to try! 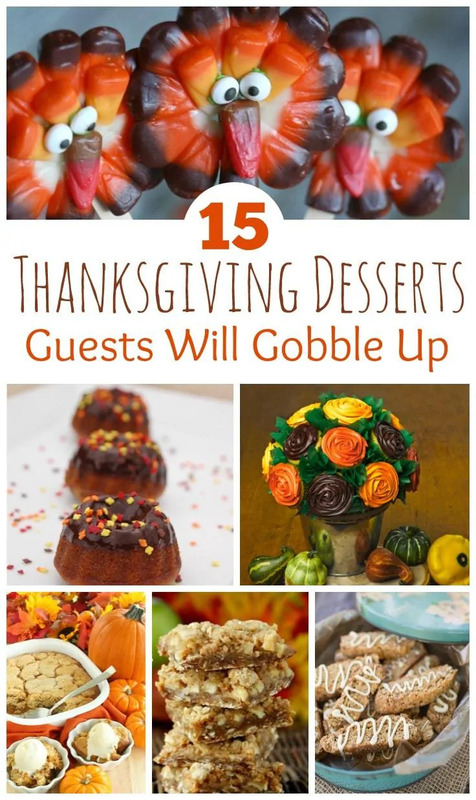 I really love how adorable the Thanksgiving cupcake bouquet looks, might have to try that one it would be a great center piece for the dessert table! Thanks for sharing! Great ideas! Now I know what I am making for dessert this year! All of these sound so good. I’m going to try the Caramel Apple Bars this week end hopefully. I love having snacks like this around. Thanks for sharing these. All of these are delicious ideas! Everything is so festive and would look great on our Thanksgiving spread. Some definite additions to my Thanksgiving menu here! Yum! Dessert is my favorite part of thanksgiving and I’m always in charge of preparing them! I love trying new recipes too! Thanks! I am right on those cheesecake brownies! OMG! I gained 20 pounds just by looking at them. Wow! What great desserts!!!! I love these recipes. Some of these are fun, and also traditional. These do look like quite delicious. I personally like the idea of having many different desserts to choose from. 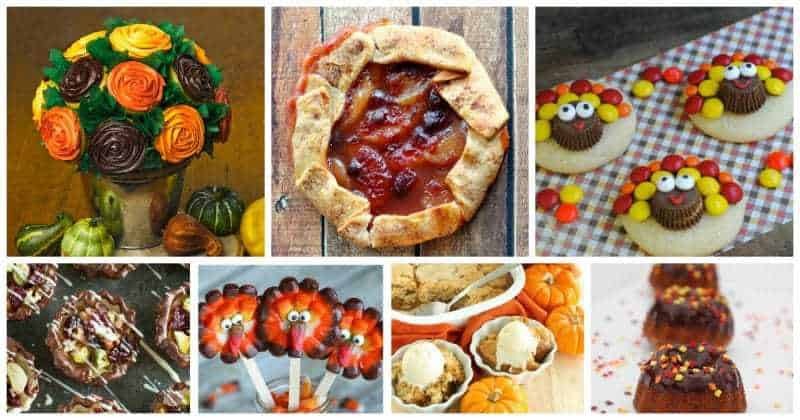 I’m going to try and make the Turkey Sugar Cookies, Nutter Butter Turkey Cookies, and Candy Corn Lollipops for starters!